Diablo Gel Wheel and Rim Cleaner is the first product that uses concentrated suspension technology to lift brake dust, dirt and contamination away from wheels and rims without hard rubbing and scrubbing which can scratch and damage surfaces ever. Diablo Gel is the only pH neutral wheel cleaner safe enough to use on any and all OEM, after market wheels, painted and powder coated wheels, chrome, carbon fiber lips, decal wrapped wheels and lips and virtually all painted surfaces. Diablo Gel's suspension technology is oxygen-rich infused. Concentrated suspension technology encapsulates dirt particles and rapidly lifts them away from the paint suspending them in a pH neutral slippery gelatin that easily rinses off wheels leaving spot-free results. Diablo Gel can be applied with a brush or sprayed directly on the wheel. Diablo Gel is non-acid based, non-caustic based, water-based extra slippery gel that safely cleans all wheels. Diablo Gel works on painted wheels, clear-coated, polished, chrome or anodized wheels. It is 100% pH balanced and neutral so it's safe for delicate wheels. A single glance at Diablo Gel clearly shows how it holds the oxygen pockets inside of the products. Diablo Gel's unique extra-slippery formulation lifts brake dust, dirt and contaminates away from any surface holding it in complete suspension so it can be safely and easily rinsed off without staining any surface. Premium natural fragrance and 100% biodegradable composition. 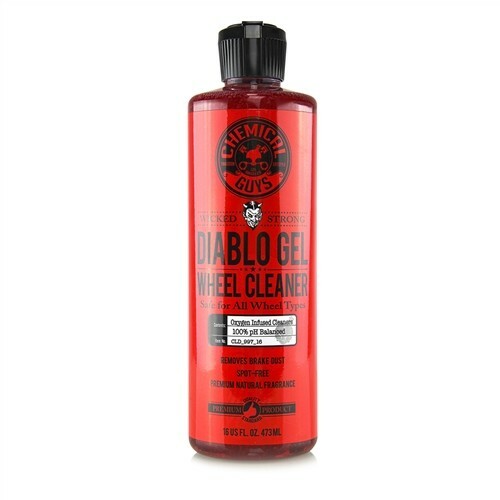 The Diablo Gel Wheel & Rim Cleaner is also available in gallon size.